When To Not Prescribe An Antidepressant? I encountered that interesting question just last week. Antidepressant medications have been around for a long time at this point and they have an increasing number of indications. Everywhere around the Internet there are algorithms that make prescribing these drugs seem easy and automatic. Qualify for the vague diagnosis and follow the line to the correct antidepressant. At the same time there is plenty of evidence that their use is becoming less discriminate than in the past, largely due to the use of checklists rather than more thoughtful diagnostic processes. It is common for me to encounter people who have been put on an antidepressant based on a "test". When I ask them what that test was it is almost always the PHQ-9 or GAD-7, checklist adaptations of DSM criteria for depression and anxiety that can be completed in a couple of minutes. There is a significant difference between the checklists and the diagnostic process as I pointed out in a previous post about the sleep question on the checklist compared with more detailed questions about sleep. The list that follows contains a number of scenarios that will not be accessible by a checklist. In those cases a more thorough diagnostic assessment may be indicated. 1. Intolerance of antidepressants - Every FDA package insert for medications includes this warning, usually referring to an allergy or a medical complication from previous use. In addition to allergic reactions (which are generally rare with antidepressants), there a number of significant problems that preclude their use. Serotonin syndrome can occur with low doses and initial doses in sensitive individuals. In the case of the more potent classes of serotonergic medications - the SSRIs as many as 20% of patients will experience agitation, nausea, headaches, and other GI symptoms. By the time that I see them, they will tell me the list of antidepressants that made them ill and that they cannot take. It is an easy decision to avoid medications that are known to make the patient ill.
2. Behavioral intolerance of antidepressants - SSRIs in particular can have the effect of restricting a person's emotional range to a narrow margin. They will typically say: ""I don't get low anymore but I also don't get as happy as I used to get." A person who is affected in that way finds that to be a very uncomfortable existence. Many have been told that they will "get used to it" - a frequently used statement about these medication related side effects. I have never seen anyone get used to a restricted range of emotion and I tell them to stop it an not resume it. I avoid prescribing antidepressants form that class and that class is typically SSRIs. "Many years ago I treated a man who came to me who had been taking a standard antidepressant for about 7 years. He was not sure that he was depressed anymore. He was sure that he had frequent headaches and very low energy. I recommended that we taper him off the antidepressant and see how he felt. He came back two weeks later and said: 'Doc - I feel great. For about the last 6 years I felt like I had the flu every day and that feeling is gone.' That is my concern about 'getting used to a medication'. It may mean that what you really get used to is feeling sick. That is why I encourage everyone that I treat to self monitor for side effects, and if they happen we stop the medicine and try something else." That advice sounds straightforward but it is not. I still get people who think that they need to "get used to" a medication and will only tell me in a face-to-face interview. 3. Lack of a clear diagnosis - many of the people I see were started on an antidepressant during an acute crisis situation like the sudden loss of a significant person in their life or a job or their financial status. There is no real evidence that antidepressants work for acute crisis situations, but some doctors feel compelled to prescribe a medication because it makes it seem like they are trying to help the patient. I have also heard the placebo response rationalized for these prescriptions. A similar cluster of symptoms can be observed along with the associated anxiety, but in the short term the main benefits to be gained will be from medication side effects like sedation rather then any specific therapeutic effect. The real problem is that the medications don't get stopped when the crisis has passed. I may be seeing a person who has been taking an antidepressants for ten years because they had an employment crisis or divorce at that time and have been taking the medication ever since. They have been tolerating the medication well for that time, but it now takes a lot of effort to convince them that they don't need the medication and taper them off of it. I try to prevent those problems on the front end by not prescribing antidepressants for vague, poorly defined emotional problems or crisis situations where they are not indicated. In my experience, psychotherapy is a more effective approach and it helps the affected person make sense of what has been happening to them. "Elevated Blood Pressure and Heart Rate: Measure heart rate and blood pressure prior to initiating treatment and periodically throughout treatment. Control pre-existing hypertension before initiating therapy with FETZIMA"
There are a number of conditions ranging from glaucoma to angina that need treatment before antidepressants can be safely prescribed. 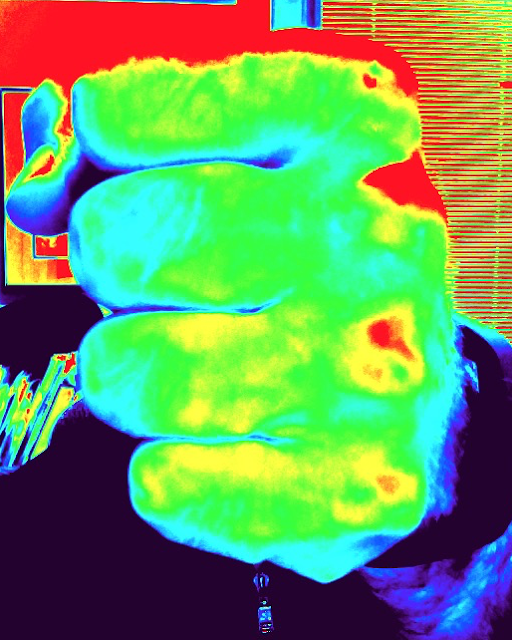 In some cases I am not happy with the pharmacotherapy for associated medical conditions. Desiccated thyroid rather than levothyroxine for hypothyroidism is a good example. Why is desiccated animal thyroid gland being used in the 21st century instead of the specific molecule? In many cases, I will refer the patient to see a specialist and they will never come back because their real problem has been solved. I posted about cervical spine disease some time ago after I had a number of patients come in for treatment of depression. What they really had was insomnia from cervical spine disease and when that chronic pain was addressed their depression resolved completely. I will run into some situations where I insist the patient see a specialist (generally a Cardiologist) to get an opinion on safety of treatment. This used to be called "clearance" by the Cardiologist but for some reason that term has fallen out of favor. I think the "clearing" specialists don't want the designation, but from my perspective the patient is not going to get the antidepressant that we discussed unless the Cardiologist agrees. 5. The patient prefers not to take the medication - I think that patients are often surprised at how easily they can convince me to not prescribe a medication. Many expect an argument. I will supply them with the information they want and direct them to reputable sites on the Internet where they can read as much as they want about the medication. I am very willing to discuss their realistic and unrealistic concerns. I will attempt to correct their misconceptions and also provide them with my real life estimate of how many people tolerate the medication and the common reasons why people stop it. I fully acknowledge that I cannot predict if a medication will work for them or give them side effects. At the end of that discussion, if they don't want to try the medicine that is fine with me. I have absolutely no investment in prescribing medication for a person who does not want it. If the person has clear reservations, I let them know they don't have to come to a decision right in the office - they can go home and think about it and call me with their decision. I am never more invested in the medication than the person who is taking it. I will also provide them with feedback on whether or not their decision seems reasonable or not. 6. Additional patient preferences - Many people will talk with me about antidepressants and say that they want to solve their problems with psychotherapy, exercise, or some other non-medical option. Many people will also talk about drugs, alcohol, cannabis, hallucinogens, psychedelics, and other drug based treatments for depression. I can offer people what is known about the scientific basis of treatments for depression and encourage effective non-medical treatment where it is indicated. I do not endorse the use of the use of alcohol or street drugs for treatment and let people know that I cannot prescribe antidepressant medication if those other substances are being used. That includes "medical marijuana". There is a risk for serotonin syndrome with various combinations of stimulants, hallucinogens, and/or psychedelics in combination with antidepressants. Some web sites that profess to provide neutral advice to people who want to experiment will often have some posts on how to mix these medications to get enhanced effects. None of that advice should be considered safe or reliable. It is an indication to me that the person cannot be expected to take the prescription reliably. 7. Context - very important consideration. Seeing a person who has just survived a suicide attempt in the intensive care unit is a much different context than seeing a long line of people who are dissatisfied with life for one reason or another. Twenty three years of acute care work taught me that medical interventions are much more likely to work for clear cut severe problems than vaguely defined problems. There are many people who are looking for a fast solution to difficult problems. When I suggest to them that environmental factors need to be addressed or that they may benefit from psychotherapy or even more explicitly that psychotherapy will work better for your problem than medications - I am often met with resistance. Common replies are that they cannot commit that kind of time or energy to psychotherapy. Since most managed care companies discriminate against psychotherapy - many will tell me that their copays are too expensive. If I point out that their work schedule or job is the problem - they will give me many reasons why they can't change it. Treatment becomes conditional - as in - I am hoping that this antidepressant will work because I cannot change my life in any reasonable way and I can't do psychotherapy. 8. Commitment to treatment - too many people come in and expect the prescription of an antidepressant to not only solve the problems but that nothing else is required of them except to show up for an occasional appointment. If I want to see medical records like exams, labs, imaging studies, ECGs. EEGs, pharmacy records or other information it is generally not an option. I need that information before any prescription occurs. The same is true if I need to order these tests and see the results. I am quite capable of having a discussion of the costs of these orders and that is why I have a preference for not repeating tests and looking at existing results. That does not prevent the occasional complaints about how I am interested in making money off the person by ordering basic tests, even though I do not get anything at all for ordering tests. The other part of treatment does involve agreeing to take the medication reliably and following the other recommendations that can be very basic. If someone tells me that they are drinking two pots of coffee per day and they are anxious and can't sleep but are unwilling to stop the coffee because: "I know that I can drink two cups of coffee and still fall asleep" - I am probably not going to be able to do much with an antidepressant. The same is true for somebody binge drinking a 12-pack of beer every night after work. The effects of common substances like caffeine and alcohol are contrary to the goals of treating anxiety and depression with or without medication. 9. Mania - it is possible for people who have taken antidepressants for years to become manic either while taking the antidepressant regularly or when the antidepressant has been disrupted. Even though the incidence of mania from antidepressants is low and the treatment of bipolar disorder depressed includes an antidepressant-atypical antipsychotic combination (olanzapine-fluoxetine combination or OFC) stopping the antidepressant acutely is the best idea. Many people discover at that point that mood stabilizers seem to work much better for their periods of depression than antidepressants. 10. Misunderstanding the treatment alliance - fortunately treating depression and anxiety is not like treating standard medical problems. Most office visits for new general medical and surgical problems are one or two visits in duration. A medication is prescribed and it either works or it doesn't. When it doesn't the problem either resolves on its own or becomes a chronic problem. One of the best examples anywhere is acute bronchitis. Over the past decades - tons of antibiotics have been prescribed for no good reason. Acute bronchitis generally resolves on its own in young healthy people. I try to be very clear with people that their response (good or bad) to the medication is in no way guaranteed. I let them know that these medications are moderately effective at best and then only in the hands of somebody who knows how to rapidly switch them up and in some cases augment them. Even then there will be some people who do not respond. The key to all of that treatment is communication and it may require significant patience on the part of the patient. It may also require more frequent appointments then they anticipated especially is associated problems like suicidal thinking and psychosis are also being addressed. Those are my thoughts about the question of who I would not prescribe an antidepressant to. I hope to transform those thoughts into dimensions in a useful graphic. Feel free to let me know if I missed anything. I try to exercise an hour a day. During that time I am either on a treadmill or an exercise bike. If I am exercising in the house, I am watching television at the same time. I watch a lot of television at the same time. Entire series on Amazon, Netflix, or premium channels. Some of this television can be motivating but even with all of that content bandwidth - I still find myself searching for the occasional independent film because there seems like there is nothing else out there. About 80% of what I watch is on Netflix and a lot of that is science fiction. The Marvel series on Netflix is a rich source of superhero type science fiction. I noticed the latest addition The Iron Fist some time ago, but that name and the visuals were not all that inspiring. At least until I stopped a very bad film dead in its tracks about 15 minutes in an switched over to Iron Fist. In the opening moments we see a disheveled young man walking barefoot through New York City. We find out that his name is Danny Rand. He appears to be fairly naive. At one point he announces that he is from a large family who owns a prominent building and the man he is talking to suggests that he should: "Sell the building an buy some shoes." He tries to get in to the building to talk with Harold Meachum his father's former partner who is currently the head of Rand Enterprises. He has to fight his way past security. He encounters the adult Meachum children Ward and Joy. They tell him that Harold is dead and they doubt his identity. They say the Rands including Danny were all killed in a plane crash in the Himalayas 15 years ago. He leaves but Ward Meachum dispatches his security forces to find Danny and beat him up or kill him. After he dispatches the security guards he breaks into the Meachum home and eventually meets with Joy back at the company headquarters. This is where several distinctly antipsychiatry themes start to kick in. Joy drugs Danny and he is taken to what appears to be a small forensic psychiatric hospital. He awakens there in five point restraints and is advised that he is on a 72 hour hold. Over the course of that hold he is given many cups of what are supposedly psychiatric medications. In some cases the orderly forces his mouth open with a tongue blade and pours the cup of capsules and tablets into his mouth. On other occasions, the orderly comes in with an absurdly large bottle of medication and draws the medication out of that bottle into a syringe and he is given an injection. He is told that the medication is given to him so that he will "cooperate". Cooperate is loosely defined as not becoming aggressive but also in some cases giving up the idea that he is Danny Rand. In short, he is basically tortured on this inpatient unit. To make matters even worse, another patient disguised as a physician with a white coat is alone with him at one point when he is being restrained. The viewer does not realize it at the time until this patient suggests that Danny kill himself and when that fails he sticks a fork under his chin and says he will kill him if he gives him the word. The aggressive patient is eventually removed, but later reinstated as Danny's "tour guide" of the unit. During that tour, he advises Danny of the folly of the 72 hour hold like this: "He was living under a bridge and came in here on a 72 hours hold. Now he has paranoid personality disorder and he has been here for 5 years. He was living on the street and came in on a 72 hour hold. Now he has schizoaffective disorder and has been here for 3 years." He simultaneously points out the folly of the 72 hour hold and suggests that people are just plucked off the street, labelled and stuck in a locked psychiatric facility for a long time. In the span of 5 or 10 minutes we have seen a homicidal patient disguised as a doctor, threatening to kill the superhero, and then becoming a tour guide who is an expert commentator on psychiatric injustices! Dr. Paul Edmonds is the psychiatrist on the floor. He is pleasantly coercive at first. He seems generally clueless about assessing acute care psychiatric patients and interacting with them. He finally catches on that Danny Rand is who he really says that he is and acts professionally for a brief period of time. He almost gets to the point where he will release Danny, but decides against it when he hears about how Danny is a Warrior Monk who is in possession of the power of the Iron Fist. At that point Harold Meachum who has been watching all of the events in the psychiatric unit remotely and who has concluded that Danny is the real Danny Rand - sends in his security to take Danny out of the hospital. In the finale to episode 2, Danny summons the Iron Fist power to dispatch the security guards who were beating him mercilessly and with a single punch - knocks down a large metal door confining him in the hospital. There are numerous cliches about psychiatric treatment that are obvious in this episode. The first is that psychiatric treatment is about social control. In this case the Meachums have a problem when Danny shows up. He owns 51% of the company stock. They get him out of the picture by drugging him and taking him to a psychiatric hospital. I have never seen that happen. In real life, if a person in the emergency department shows up there drugged and points out that somebody did this to them, the police would be dispatched to pick them up for assault. The associated dimension here is that the psychiatrist and the hospital are working for the Meachums and doing their bidding at least until Dr. Edmonds finally refuses to provide Joy confidential information on Danny. In my 23 years of inpatient work, treatment was focused on the best interests of the patient, and confidential information was not provided without consent. Forced treatment was portrayed in as heavy handed a manner as possible. The patient was drugged to the point that he was "in control" and in one situation ready to cooperate by accepting a false identity. Dr. Edmonds also appears to lack skill at two levels. It takes him too long to find out who Danny really is and them it seems only by a bit of luck. When he finally does that, he is unable to assess the patient's superhero story (trained warrior monk from the Mother of the Crane order in the mythical K'un-Lun that appears from another dimension once in every 14 years), see it for what it is and release him. Any inpatient psychiatrist has seen and discharged their share of superheroes. Delusional or not - treatment depends on local legal convention and the bias is heavily stacked toward no treatment by the courts and business systems. Businesses don't want anybody spending any length of time in a psychiatric hospital whether they are stable enough for discharge or not. But I suppose that is a far less dramatic premise than psychiatrists and psychiatric hospitals detaining people and torturing them. At no point do we see legal representatives and representatives of the court to protect the civil rights of anyone who is on a legal hold or subject to involuntary treatment. The viewers have to suffer through another skewed treatment of psychiatric care and an unenlightened view of the containment function of psychiatric units. There is a clear mischaracterization of acute care or inpatient psychiatric units. Anyone experienced with psychiatric disorders and severe addictions realizes that there are some mental disorders where the person's ability to self correct is gone. That results in uncharacteristic behaviors that can include aggression, suicide, self-injury, and a long list of high risk behaviors that endanger health and life. A common example is mania without psychosis. The manic person can carry on a coherent conversation but may have been hospitalized because his or her judgment and decision-making was greatly impaired by the manic state. A consistent treatment environment is required to assist that person in getting back to their stable mood and decision-making. Having an appropriate treatment unit available can prevent life altering events that can be associated with severe mental disorders. When I refer to a containment effect - it means providing a safe environment for these changes to occur and there are multiple pathways to stability. I know a lot of people will say it's just a television show. It is a television show with considerable viewership in a country with meager resources for psychiatric treatment. It is a television show in a country that is a mill for antipsychiatry fake news. It is also part of an ongoing process that stigmatizes people with mental illnesses and psychiatrists. You only have to look as far as network television and Gotham or American Horror Story to find an equally grim depiction. It seems that the default horrifying and anxiety producing storyline is to go back to the old myth of the psychiatrist as bogeyman. The treatment situation is so desperate that in current politically correct times - people with mental illnesses, their families, and doctors need to be treated realistically just like it would occur with any other disadvantaged minority. Get real with portrayals of mental illnesses, psychiatric treatment, and psychiatrists and drop the unnecessary drama and distortion. It deters people from seeking the safety and treatment that they need and keeps politicians and the businessmen in charge of medicine and cutting psychiatric services to the bone. It's the 21st century and it is time to wake up and realize that there is an enlightened approach to these problems. 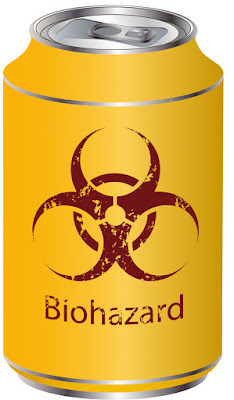 Is Diet Soda A Biohazard? I woke up to a scary story about diet soda several days ago. At least I thought it was scary. It was clear at some point the the reporter had lost track of what the story was all about and was talking about regular and diet soda as being interchangeably toxic. I can see how that might happen, since most of the recent soda scares have focused on regular soda or as it is referred to "sugary" soda. Sugar is the current hysteria and it must be eliminated. The media routinely informs us that for years cholesterol and fat were vilified and now we have that all wrong. Fat and cholesterol are now acceptable and sugar is the villain. To complicate matters, the message is to consume large quantities of colorful fruits and vegetables - 6 - 8 servings a day. The problem is those colorful fruits on a serving per serving basis generally contain as much sugar as "sugary" soda. The latest story was presented as they all are - a news headline rather than a work in progress. News flash - drink diet soda and you will get Alzheimer's Disease or a stroke. In fact - drink as little as 1 can per day and get a stroke. A few news outlets, talked about the other part of the story - consuming those sugary drinks in the same study did not increase the risk for dementia or stroke. But even then it was presented in way to keep the hysteria going: "That does not mean you should start drinking those sugary soft drinks?" Really - why not? You just told me they don't cause strokes or Alzheimer's Disease. Oh that's right - they contain that well known toxin - sugar. Time for some self-disclosure in the interest of transparency before I get to the real story. I eat a lot of sugary foods. I like just about every imaginable kind of desert. I am generally averse to vegetables unless they have a starchy consistency. I have consumed massive amounts of soda and diet soda in my life time. I realize that everybody has a story of the outlier who beat the food and health odds. "Grandpa smoked two packs of cigarettes a day and died at 95 of old age" or "Grandpa ate raw bacon every day and died at 95 of old age." That is not my point here. As a physician, more than anybody I know better than to challenge medical common sense and hope to survive it. I happen to be a health nut who consumes junk food. I don't eat meat, fat. or cholesterol and I exercise a lot. If I had to guess where the proclivity for sweet consumption comes in - I would attribute it to the Scandinavian side of my genome - cookies, pies, cakes, donuts with coffee of course. So I am not here to defend or vilify sugar or artificial sweeteners. In fact, I would definitely try my hardest to stop consuming this stuff if it was really a biohazard. With that self disclosure, the real story in this case is easy to find and publicly accessible. There is not only the original research article but an editorial. To keep myself honest, I wrote about the article without reading the editorial first. but did read it. The original article and the editorial are references 1 and 2 respectively and full text is available. One of the associations I automatically have when dealing with food headlines is the Framingham Study. This study was big when I was in medical school. It offered the first exposure to epidemiology and risk factor analysis in cardiovascular pathology. That was built on in the epidemiology course where several of the professors were experts. There were board exam questions based on a knowledge of this study. Generations of physicians have studied papers based on this study and probably react to the cardiovascular risk factor headlines the same way that I do. I was mildly surprised to see that this study of diet soda and sugar sweetened drinks was based on the Framingham Study. In this case the researchers looked at the Framingham Heart Study Offspring cohort. That study began in 1971 with 5124 volunteers. The participants are studied in examination cycles about every 4 years. To date that means there have been 9 cycles so far with the last one occurring in 2014. For the purpose of this study, they looked at the 10 year risk of stroke and dementia beginning with the 7th cycle (1998-2001). A total of 3539 subjects were available at exam 7 and 3029 completed the Food Frequency Questionnaire (FFQ). That population was split based on age and other criteria to an arm that was to be analyzed for 10 year risk of of incident stroke (N=2888) and another arm that was to be sampled for 10 year risk of incident dementia. The FFQ was used to determine total sugary beverage consumption, sugary sweetened soft drink, and artificially sweetened soft drink in various rates of consumption where one can or bottle equaled one drink. Answers at exam cycle 7 were used to measure recent intake and averaged responses over exams 5,6, and 7 were used to calculate cumulative intake over 7 years. This was a prospective study, so time to stroke or dementia (using standard definitions) was done over the next ten years (from examination cycle 7). The total number of events form the article are listed below. The article contains tables detailing all of the demographic details by cohort and by consumption of sugary or artificially sweetened drinks. The authors also present 10 year survival curves for both the stroke and dementia cohorts. About 53% of the sample drank at least 1 artificially sweetened drink per week with 18% drinking more than one per day. The main finding was that consumption of any amount of artificially sweetened soft drinks was associated with risk of stroke in both the case of recent (HR 1.88-2.17) and cumulative intake (HR 1.75-2.20). Drinking greater than or equal to 1 artificially sweetened soft drink was associated with increased risk of all-cause (HR 2.28) and Alzheimer's dementia (HR 2.48) but only in the cumulative intake mode. They controlled for two major variables - hypertension and diabetes mellitus are immediately relevant for both strokes and dementia. Controlling for diabetes mellitus, intake of artificially sweetened beverages remained a significant predictor of stroke, all cause dementia and Alzheimer's dementia but diabetes was found to be a partial mediator of the effect. Excluding people with hypertension decreased the effect of artificially sweetened drinks on all strokes. When I thought a bit more about the study, there was no clear mechanism of why strokes and dementia would be produced by artificial sweeteners. They discuss theories about how these compounds have been implicated as increasing cardiometabolic risk factors. The other factor is that several of these compounds have been consumed by the public for over 50 years. The FDA provides information that some of the compounds have been extensively studied for safety in both animals and humans. Is it possible that the FDA missed some excessive cardiovascular, cerebrovascular or dementia mortality due to high-intensity sweeteners? Their approach seems to be to suggest an average daily intake (ADI) of these compounds and suggest that consuming that amount over the course of a lifetime is safe. The other main factor that affects how physicians think about these studies is whether or not there is supporting or contradictory data. This paper lists the Nurses Professional and Health Professionals Follow-Up Study that showed that both artificially sweetened and sugar sweetened soft drinks were both associated with a higher risk of stroke over 28 years of follow up for women and 22 years of follow up for men. The sample size was large (women N=84085 and men N=43371). The pooled Relative Risk of stroke was 1.16 and the authors suggest drinking decaffeinated coffee reduced risk. The authors also listed the Northern Manhattan Study (N=2564) that showed that artificially sweetened soda increased the combined risk of vascular events but not stroke. In the editorial, the authors list two negative studies. In the first, there was an association between coronary heart disease and biomarkers of coronary heart disease for sugar sweetened beverages but not artificially sweetened beverages (6). The second study (7) showed the identical result with risk for sugar sweetened but not artificially sweetened beverages. I am always skeptical of the results of studies with many variables and clear-cut effects - at least until they are replicated. This is a good study that will be quoted for years. You can't believe what you hear in the media about it - but to physicians and researchers it raises significant questions. I think that it is useful to known this literature in order to discuss it with people who need to take specific medications that increase their cardiometabolic risk like atypical antipsychotics. At a personal level, the question is what if anything should be done? It is clear that although the study points to increased risk, the majority of the research subjects who ingested diet soda did not experience an adverse outcome during the test period. Doing a basic literature search shows that there are many epidemiological studies looking for various adverse outcomes from artificial sweetener exposure and few positive findings. I will take it as a sign that I need to get more disciplined in terms of my intake of high intensity sweeteners as well as sugar. Why take something toxic if there is even a theoretical risk? The answer of course is preferences over time and those preferences die hard. 1: Pase MP, Himali JJ, Beiser AS, Aparicio HJ, Satizabal CL, Vasan RS, SeshadriS, Jacques PF. Sugar- and Artificially Sweetened Beverages and the Risks of Incident Stroke and Dementia: A Prospective Cohort Study. Stroke. 2017 Apr 20. pii: STROKEAHA.116.016027. doi: 10.1161/STROKEAHA.116.016027. [Epub ahead of print] PubMed PMID: 28428346. 2: Wersching H, Gardener H, Sacco RL. Sugar-Sweetened and Artificially Sweetened Beverages in Relation to Stroke and Dementia: Are Soft Drinks Hard on the Brain? Stroke. 2017 Apr 20. pii: STROKEAHA.117.017198. doi: 10.1161/STROKEAHA.117.017198. [Epub ahead of print] PubMed PMID: 28428347. 3: Kissela BM, Khoury JC, Alwell K, et al. Age at stroke: Temporal trends in stroke incidence in a large, biracial population . Neurology. 2012;79(17):1781-1787. doi:10.1212/WNL.0b013e318270401d. 4: Barraclough H, Simms L, Govindan R. Biostatistics primer: what a clinician ought to know: hazard ratios. J Thorac Oncol. 2011 Jun;6(6):978-82. doi: 10.1097/JTO.0b013e31821b10ab. Erratum in: J Thorac Oncol. 2011 Aug;6(8):1454. PubMed PMID: 21623277. 5: Bernstein AM, de Koning L, Flint AJ, Rexrode KM, Willett WC. Soda consumption and the risk of stroke in men and women. Am J Clin Nutr. 2012 May;95(5):1190-9. doi: 10.3945/ajcn.111.030205. Epub 2012 Apr 4. PubMed PMID: 22492378. 6: de Koning L, Malik VS, Kellogg MD, Rimm EB, Willett WC, Hu FB. Sweetenedbeverage consumption, incident coronary heart disease, and biomarkers of risk in men. Circulation. 2012 Apr 10;125(14):1735-41, S1. doi: 10.1161/CIRCULATIONAHA.111.067017. Epub 2012 Mar 12. PubMed PMID: 22412070. 7: Fung TT, Malik V, Rexrode KM, Manson JE, Willett WC, Hu FB. Sweetened beverage consumption and risk of coronary heart disease in women. Am J Clin Nutr. 2009 Apr;89(4):1037-42. doi: 10.3945/ajcn.2008.27140. Epub 2009 Feb 11. PubMed PMID: 19211821. "Yellow tin for drinks with a symbol of biological danger" by Liusa. Consistent with my above statement - I took a bottle of my current favorite soda and diluted it by 1:1 with carbonated water. There was no appreciable degradation of flavor or carbonation. That is a reduction of 190 to 95 calories/16 ounce and 50 g to 25 g sugar (One teaspoon of sugar is 4.2 grams). I did the same thing with a 3:1 dilution. It was slightly more watery but still a reasonable taste. I have used this technique for years with fruit juices in order to avoid the high sugar content and it can clearly be applied to colas with the same result. From reference 1 - see for details. My first job as a staff psychiatrist was in a clinic in Superior, Wisconsin just across the harbor from Duluth, Minnesota where I lived. For two of the years I worked there, a local television station would interview me about depression, suicide, and Christmas - at least that was their take on the story. What would be better drama than a tumultuous family gathering, heated arguments, disappointment, and increasing depression? That would be a great dramatic story if it was true, but it is not. For two years, I battled with the reporters to tell the real story about seasonality and suicide, but in the end I lost. Prior to the last interview, I went as far as saying: "Look - don't make the connection between Christmas and depression or suicide. It really does not exist." The first question I was asked: "Isn't it true that depression peaks at Christmas time? Can you suggest a few reasons why that occurs?" I fumbled along trying my best to explain what really happens. All of these interviews are heavily edited down to a couple of sound bites. The final version really did not have much to say about anything. In the intervening 30 years, I have had a lot of time to think about the problem. To a clinical psychiatrist the main problem is suicide prevention. 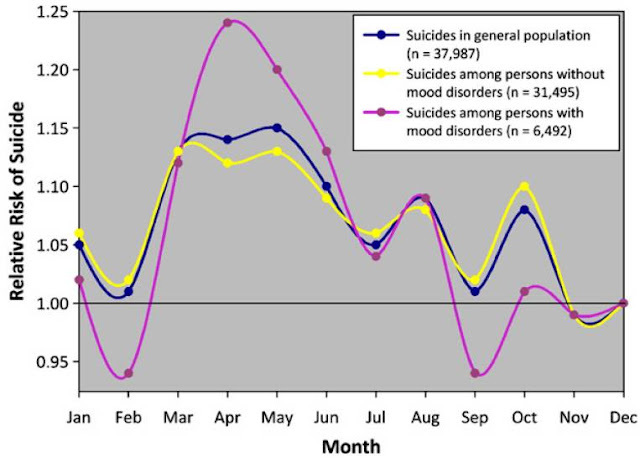 Seasonality and suicide is never really mentioned in modern day suicide assessment or treatment. The popular screening checklists don't have anything to say about seasons. I have no doubt that clinically - suicidal thinking and suicide attempts correlate well with what is written in the literature. The literature says that late spring is the peak season for suicides and that is what I have observed directly over 30 years of experience. The main question is how this is relevant to the treatment and prevention of suicidal thinking and behavior. In the referenced review, the authors do a reasonable job of summarizing what is known about the association of various environmental factors and suicide. Studies of rare events are always affected by the ecological fallacy of inferring the behavior of individuals from membership in large groups. We end up with extremely small numerators of people who have completed suicide relative to their membership in rather massive groups - like all Spring allergy suffers or in the case of biological psychiatrists the even larger group of everyone with seasonally low tryptophan levels. The authors description of the effect of seasons on tryptophan levels and serotonin turnover is interesting but I disagree with their conclusion. I do not think that much higher levels of serotonin turnover in bright sunlight negate tryptophan levels as an arbiter of suicidal behavior in the late spring. We are currently approaching the end of April in southern Minnesota. That last two days have been bitterly cold and wet. Everybody is talking about how gloomy and depressing the weather is. At this point in time, practically every friend, family member, and patient I have seen has had at least two upper respiratory tract infections (URI) of varying severity. These viruses are generally flu-like illnesses (FLI) in that they produce all of the same symptoms except high fevers and can last up to 2 1/2 weeks. In April and May, the population is in survival mode and we are looking for a break. It doesn't necessarily have to be better weather, but that is the only practical way to be rid of the pestilence that is associated with winter. The authors in the review look at cytokine and immune modulated mechanisms but they are highly speculative. Not enough is known about the specific environment that suicidal people have experienced. In the USA for example, not everybody at a certain latitude will see reduced sunlight and epidemic exposure to URIs. At some point technology may allow widespread sampling and reconstruction of the true environment. In the mean time studying specific work or school environments may be a more productive research approach. Seeing patients who tell me that they are getting more depressed and experiencing suicidal thoughts this time of the year makes me more vigilant. After seeing most patients with these problems, I run the conversation back in my head a few more times than usual. I am trying to see if I may have missed anything. It is my version of the preemptive psychological autopsy - to prevent the necessity of a real one. Psychotic depression can be very subtle and people with that particular problem can be difficult to establish a working alliance with. They may also have suicide attempts by highly lethal means. The most important part of the conversation is giving them hope and having a plan to access emergency services. But even before that I caution them that the progression to a state where they consider suicide is a sequence of events that needs to be recognized and interrupted at the earliest possible point. All of that is the talking necessary in addition to any pharmacotherapy. One of the most important aspects of any mental health crisis is recognizing that you will be coming through on the other side. That is as true about Spring as it is for anything else. 1: Woo J-M, Okusaga O, Postolache TT. 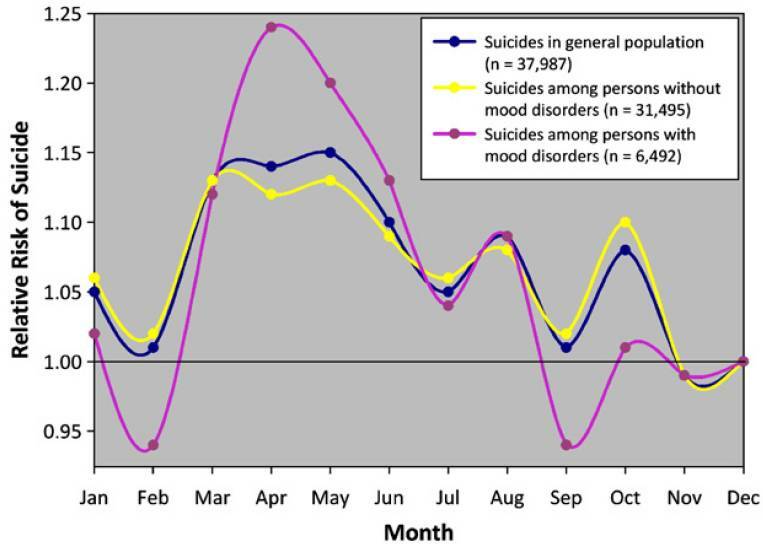 Seasonality of Suicidal Behavior. International Journal of Environmental Research and Public Health. 2012;9(2):531-547. doi:10.3390/ijerph9020531. Creative Commons Attribution 3.0 Unported (CC BY 3.0) license. Original graph is unaltered. 2: Hankoff LD. Suicide and attempted suicide. in Handbook of Affective of Disorders. Eugene S. Paykel (ed). The Guilford Press. New York. 1982 pages 417-428. When and Where Does Depression End? For the past 7 years I have been seeing patients who have been carefully selected for having an alcohol or other substance use disorder. My task is to determine if there is an associated psychiatric disorder, whether or not it can be treated, initiate treatment, and follow up. Most of the people I see have anxiety and/or mood disorders and determining adequacy of treatment and the actual diagnosis can be a challenge. I have highlighted a couple of the problems in the past including a high prevalence of primary sleep disorders and the issue of people with disorders of temperament that might seem like a primary disorder but that are fundamentally different. These distinctions are critically important in terms of when the disorder ends if it is treated. I don't think the problem have been adequately addressed in the literature. In many ways it is a failure to recognize that conscious states exist out there that are not easily captured by a handful of descriptors or the derivative checklists. Checklists are frequently seen are the endpoints in clinical research. They are used to determine if treatments are effective. A couple of texts (1,2) describe typical endpoints for depression. In the first reference the authors discuss the concept and how it has evolved since the 1970s from broad terms like treatment resistant to more specific antidepressant resistant or refractory. They discuss staging methods including the Thase and Rush staging method (TRSM), the European Staging Method (ESM), the Massachusetts General Staging Method (MGH-S) and the Maudsley Staging Method (MSM). The ratings vary in how they rate the treatment resistant dimension (antidepressant resistant, electroconvulsive resistant, duration of trials). The MSM is the only scale that rates multiple dimension including symptoms severity at baseline, duration and specific number of treatment failures. Treatment resistance is a biological psychiatry based term that is not applied to psychotherapy. Looking at what is available, there should be concerns about people being able to recall that level of detail. I prompt people with a list of all known medications. A substantial number of people cannot recall medication names, even when prompted. Unless the medication regimen has been uncomplicated like: "I took fluoxetine for 10 years and then changed to venlafaxine" specific duration will not be recalled (the ESM has 5 specific intervals of treatments demarcated in weeks). Unless medical records are available for review by researchers, I would be skeptical of a large population of research subjects being able to provide the information necessary to make these classifications. I generally try to reconstruct the history from late childhood and adolescence through adulthood. That allows for the determination of global subtypes of depression from persistent depressive disorder or what used to be called dysthymia to discrete episodes of major depression. When I was trained we had an entity of double depression or episodes of major depression superimposed on dysthymia. In DSM-5 parlance that would be called persistent depressive disorder with intermittent major depressive episodes with or without current episode. Since the diagnostic criteria for persistent depressive disorder involves having at least two of six symptoms that results in a total of 15 combinations of two symptoms. In focusing on how to determine if the depression is gone most clinicians like myself are looking at binary outcomes. We are treating depression until the symptoms are gone. Research studies depend more on metrics like rating scales that are done directly by the research subjects or researchers. Remission or partial remission is based on the scores of those rating scales. For example, a typical psychopharmacological study would look at either the amount of decrease on a depression rating scale or where the rating scale score is relative to the established cutoff. For example, treatment resistance could be defined as less than a 50% reduction in depression rating scale scores after a course of treatment. It could also be defined as a failure to attain the require responder score or remission score after an adequate course of antidepressant therapy. In primary care these days, a lot of people are diagnosed and treated with a depression rating scale - the PHQ-9. Their PHQ-9 scores are tracked and their depression is classified as remitted if their score is 5 or less (the total score ranges from 0-27). MD: "Do you remember the first time we talked and you told me that you had been depressed since middle school and it had never gone away? With the improvement you are noticing right now - do you feel like it has gone away?" Pt: " I am a lot better but I still feel depressed. I would say that I am about 60-70% better." MD: "We have covered pretty much all of the critical symptoms for depression. Let me ask you - what else would need to clear up right now in order for the depression to be completely gone?" Pt: "I guess my wife and family would need to treat me better. I know that you can't do much about that - but that is a big problem. If that happened I would be feeling a lot better?" What to do about what seems to be an external factor affecting our neat little conceptualization of depression? A typical formulation considers this to be an external factor. A factor amenable to environmental engineering or adaptation. Either way, the patient is still depressed despite what appears to have been a significant treatment effect. On dichotomous analysis of depressive symptoms appear to have resolved for the most part. He could be handed a rating scale and score in the mild to moderate range. But the most important part of the assessment is that he still feels subjectively depressed. In the 1970s or 1980s general systems theorists proposed that the brain is able to develop models of the environment so well that becomes an important part of any central nervous modulated process. Motor activity provides the most obvious models. A person walking with a cane has a much different cortical representation of what walking with a cane is than before they walked with a cane. The cane is an actual extension of the CNS process. You can easily demonstrate this by going through the motions of brushing your teeth without the tooth brush. Within seconds it is obvious that you are not engaged in the same process and the parts are much more than the weight and feel of the toothbrush. Can this exist in depression? Can there be brain representations of relationships that are disturbed and lead to chronic depression? I don't see why not. Many psychiatrists would see this as a bad thing. Many critics of psychiatry would see this as a good thing. I see it as a brain thing. A person would have to be fairly naive to believe that the most complex object in the universe could be parsed into a couple hundred diagnoses based on verbal criteria. That is why psychiatrists are extensively trained. Trained psychiatrists should be able to do much more than read the DSM-5. I think that this is where Kendler's idea about indexing is valuable. These are ballpark estimates of problems that need further refinement both over the course of treatment and by active research. Formulations of these estimates can allow for successful medical treatment as well as successful psychotherapy. These formulations can also suggest when active treatment can stop and a person can pick up the ball and start to make a lot of discoveries on their own - whether they consider themselves to be chronically depressed or not. There is more to life than a score on a rating scale. 1: Carvalho ACCF, McIntyre RS. Treatment-resistant mood disorders. Oxford: Oxford University Press; 2015. 2: Greden JF, Riba MB, McInnis MG. Treatment Resistant Depression, A Roadmap for Effective Care. American Psychiatric Pub; 2011. Does Learned Helplessness Explain The Suicidal Thoughts Of Medical Students? The headlines are everywhere. Medical students have a significant prevalence of suicidal thoughts and suicides. The typical explanations are burnout and depression associated with the rigors of medical training. Considering that medical training has always been rigorous the obvious questions include - is depression and suicidal thinking more prevalent now and if that is true - why? The research offers little hard data. There are no consistent longitudinal studies that use the same methodology to look at the issue of suicidal thoughts or suicide attempts in medical students. The studies are generally cross sectional using diverse methodologies and involving different cultures (1). The prevalence of suicidal thoughts varied from 11.2 to 14% for a given year. The prevalence of lifetime suicide attempts ranged from 1.4 to 6.2%. Some studies have determined suicide rates for male (15.6/100,000) and female medical students (18.9/100,000). This studied showed no difference between suicide rates in men compared with the general population but higher rates for women. Most studies do not look at comparison with rates in the general population. There is no evidence that I am aware of that medical training has become more rigorous or stressful than it used to be. In my early training days, I saw residents in particular subjected to training schedules that I am guessing can no longer occur due to limitations on work hours. Some of the best examples were surgical specialty rotations where second and third year residents hardly ever left the hospital. Even as an intern in those days it was common to work 24 hours straight and then the next day until 5 PM or (total of 36 hours) every three or four days. Those schedules were exhausting but they were widely accepted until recent changes were made in the allowable hours for trainees. The volume of material covered in medical school combined with the poorly defined guidelines about what needed to be known to be a proficient physician is not the most efficient approach to study. Comparing medicine to a rigorous undergraduate course of training illustrates the problem. If I was taking Physical Chemistry as a chemistry undergraduate, I knew I had to read specifics sections of the text, know the lecture notes, and take the tests on the lecture notes and text. In medical school, the connections are less clear. You can read one (or more) texts and know the lecture notes, but the testing was often guess work and typically on a body of knowledge that was more fluid - it might not hold up from year to year. That level of inefficiency keeps people studying far too long in order to take tests that in the long run mean a lot less. The typical way that depression and suicidal behavior in physicians and trainees is studied is to look at the prevalence of depression, suicidal ideation and suicide in these populations. Those studies generally suggest that suicide as a preventable cause of death is one that physicians as a group are not good at self correcting (2). The typical comparison is that physicians as a group are better than the public at large when it comes to smoking cessation and reduced risk for cardiovascular and pulmonary disease. That has led some experts to hypothesize that unlike smoking, getting treatment for depression and suicidal thinking involves many barriers relative to other health care interventions. Physicians may be more concerned about confidentiality, stigma, and the potential impact on career than with standard health measures. In some cases the issue of reporting and disciplinary action has been mentioned. Expert opinion generally recommends education about depression and suicidal thinking in physicians and facilitating access to mental health care. Screening trainees for depression has also been suggested. Burnout has become a popular theory lately and efforts to put a number on burnout suggest very high rates in most medical specialties. The relationship of burnout to depression and suicidal thinking is less clear. As I looked at the problem over time, the most striking factor in medical practice has been the total loss of control by physicians. Thirty years ago, all of the medical students and residents in training programs were exposed to strenuous training schedules, but they also saw physician models who could provide the latest scientific care and have a direct impact on the patient and the treatment environment in general. Most medical students start out valuing direct patient contact time. The ones who don't end up in fields where there is minimal patient contact. The contrast today is striking. Today students and residents as exposed to training environments that are under the strict control of business managers. This management is frequently a direct obstacle to scientifically based care and a frequent obstacle to routine care. What rational person is going to subject themselves to intensive and stressful training only to see that their professional futures are under the control of people who routinely interfere with care and who can waste physicians time to an incredible degree based on a whim? To me this seems like a textbook example of the learned helplessness paradigm and observing it. Learned helplessness is a research paradigm for depression. In laboratory animals, it is observed when the animal is subjected to an inescapable aversive stimulus. At some point the animal just stops responding (trying to escape). That response deficit is associated with biological markers consistent with depression and it can be treated with some of the same pharmacological agents used to treat depression. Rodent models of learned helplessness are considered screens for molecules that have potential antidepressant effects. An interesting variation of this effect is learned helplessness by proxy. Animal studies show that fear conditioning can be learned by proxy (3,4). There is a research literature on the intergenerational transmission of anxiety and depression (6). These studies suggest that the learning effects, especially in environments where there is a significant amount of emotion, can be significant. Less studied phenomena like identification with mentors are also in effect in these environments. There are several linear crisis model of suicide that are generally based on a progression of risk factors. In my experience suicide is a non-linear process that involves subtle changes in the conscious state. Stressful and emotional environments are more likely to be associated with these altered conscious states. With physicians at all levels of training there are several factors that make it very difficult to escape a real or imagined failure in pursuing a career in medicine. The debt factor is significant (7). One of the ongoing justifications of physician salaries in the US is the high cost of medical training. Walking away from that is an anxiety producing scenario and yet one study showed that 40-46% of medical students considered that due to excessive workload and exam stress (1). The expectations of mentors, friends, and family is a variable consideration that can increase the thoughts of failure for men and women at this life stage. Most physicians in training have some idea of what real medical practice will be like when they are finally ready to make that transition. There used to be clear models in the form of the attending physicians encountered on rotations. My recollection of these attendings were that they appeared to have normal and full lives, especially in the time they were not active in clinical rotations. Today medical students and residents don't see practicing physicians with normal lives. They don't see physicians coming in for one or two month rotations. Now they see practicing physicians who rotate one week on and one week off all year long for the rest of their lives. They see primary care fragmented between clinic staff and hospitalists. In the case of psychiatric rotations, they generally see people hospitalized in settings where nobody wants to stay, nobody really gets much better, and readmission rates are very high. Ruling all of this are case managers with no medical training - telling the attending physicians what to do. That has got to be a shock that puts many medical students off of the idea of a career in medicine even before they get started. It gives them the message that they did not really need to go to medical school when their decision making is dictated by business managers. It also gives them the message that they are a cog in business-of-medicine machine and cannot expect much personal contact with patients or medical treatment based on that relationship. Finally - they notice the science of medicine that they were immersed in has suddenly become relative to the next great idea of the head administrator. Whatever that business idea is - suddenly all of the physicians in the organization are doing it whether it is scientific or relevant. Concerns about suicide prevention are always a legitimate endeavor, irrespective of the quality of the epidemiological evidence. As physicians we have an obligation to recognize when our colleagues are in crisis and try to help them. There do appear to be significant barriers to medical trainees and physicians getting help and that should be widely recognized. I fear that the deteriorated practice environment is not being given sufficient weight as an etiological factor. What sense does it make to go through what is widely acknowledged as very stressful training, when in the end physicians are no longer allowed to practice as professionals? What impact occurs when trainees observe that many physicians are currently practicing like they did when they were residents - with no end in sight? Learned helplessness has always been there - but now instead of being limited to training it is a permanent dimension of medical practice. That sounds like a recipe for desperation to me. It is time for the profession to acknowledge that professional control of the practice environment is necessary not only for the good of our patients but for our own well being as well. 1: Rau T, Plener P, Kliemann A, Fegert JM, Allroggen M. Suicidality among medical students - a practical guide for staff members in medical schools. GMS Z Med Ausbild. 2013 Nov 15;30(4):Doc48. eCollection 2013. Review. PubMed PMID:24282451, (figures cited above are from numerous references in this paper). 2: Center C, Davis M, Detre T, Ford DE, Hansbrough W, Hendin H, Laszlo J, Litts DA, Mann J, Mansky PA, Michels R, Miles SH, Proujansky R, Reynolds CF 3rd, Silverman MM. Confronting depression and suicide in physicians: a consensus Statement. JAMA. 2003 Jun 18; 289 (23): 3161-6. Review. PubMed PMID: 12813122. 3: Ramaker MJ, Dulawa SC. Identifying fast-onset antidepressants using rodent models. Mol Psychiatry. 2017 Mar 21. doi: 10.1038/mp.2017.36. [Epub ahead of print] PubMed PMID: 28322276. 4: Bruchey AK, Jones CE, Monfils MH. Fear conditioning by-proxy: social transmission of fear during memory retrieval. Behav Brain Res. 2010 Dec 6;214(1):80-4. doi: 10.1016/j.bbr.2010.04.047. Epub 2010 May 2. PubMed PMID: 20441779. 5: Jones CE, Riha PD, Gore AC, Monfils MH. Social transmission of Pavlovian fear: fear-conditioning by-proxy in related female rats. Anim Cogn. 2014 May;17(3):827-34. doi: 10.1007/s10071-013-0711-2. Epub 2013 Dec 6. PubMed PMID: 24310150; PubMed Central PMCID: PMC3984423. 6: Nauta MH, Festen H, Reichart CG, Nolen WA, Stant AD, Bockting CL, van der Wee NJ, Beekman A, Doreleijers TA, Hartman CA, de Jong PJ, de Vries SO. Preventing mood and anxiety disorders in youth: a multi-centre RCT in the high risk offspring of depressed and anxious patients. BMC Psychiatry. 2012 Apr 17;12:31. doi: 10.1186/1471-244X-12-31. PubMed PMID: 22510426. 7: Priceonomics. Which Graduate Degree Gets You Out of Debt the Fastest? April 13, 2017. Quotation of the song lyrics posted here for academic illustration only. Song was released in 1994 and copyrighted by Virgin Records. Use here does not imply endorsement by or affiliation with the artists or label and is strictly for non-commercial educational purposes. One of the dynamics that I consider to be essential to the survival of the profession is whether there is any way to resist the manipulations of the managerial class. Since the profession has been almost completely subordinated to the managerial class, the question may not seem very relevant. Too much depends on physician independence to give it up that easily. Without physicians independence there is really nobody advocating for our patients. Do we really want to be cogs in a government sanctioned business empire that decides when people live and people die or who gets medication or who gets reasonable medical care? There is no physician I know who is willing to give those decisions up to administrators. Those decisions are happening by manipulation and default every day. Administrative representatives sitting in on medical teams with the full blessing of the CEO or department head. Cross them and you may be out of a job either directly or pressured out by becoming person non grata or a handy "disruptive physician" label. That is a high price to pay for disagreeing with management, especially when they are making decisions that only a physician is trained to make. I have had the opportunity to work with residents and early career physicians for about the past 15 years and I noticed that they had a tendency to get a lot less riled up about these scenarios than I did. It is paradoxical in a way. Even though older physicians tend to be much more bothered by the managerial class than our younger colleagues, all of the burden of these managers is falling directly on them. Electronic health record (EHR) mandates, EHR software that is essentially junk, arbitrary maintenance of certification (MOC) requirements, billing and coding requirements to avoid financial penalties, and on and on and on. The burden of the managerial class on physicians gets worse every year and there is no end in sight. There has been very little resistance to this burden. The only exception that comes to mind in the National Board of Physicians and Surgeons - an alternate route to maintenance of certification through standard life-long learning approaches rather than the methods recommended by the American Board of Medical Specialties (ABMS). The NBPS was founded by Cardiologist Paul Teirstein, MD who graduated from medical school in 1980. As far as I can tell there is very little research on the generational effects of changing physician demographics. By that I mean - how are the specific groups of physicians impacted by excessive management, do they react to it, and do they have any success in changing it in a positive way for physicians. The raw data on physicians based on Census data is fairly interesting. Looking at the graph below the population of physicians is fairly stable between the current age range of 34-59 with a more even distribution of men to women starting with 32 year olds. That distribution has been more even in psychiatry than more other specialties for much longer - at least the departments that I have worked in. Using standard generational nomenclatures that means that there are still physicians practicing who were born in 1945 or earlier (72 yo and greater). The Baby Boomers are in the 53-71 yo range. Gen X are the 41 - 52 year olds. The Millennials are 22-40. It looks like there are also a total of 34 Gen Y physicians who are currently 21 years of age. All of the named generations seem to be represented. I don't put much stock in generational characteristics being applied across standardized age ranges. Certainly younger physicians are more likely to text and use more Smartphone apps, but it really is impossible for physicians practice these days and not have more than a passing command of basic technology. If they don't know it and the implications, they will probably have to be trained in it. The demographics are available but outside of the burnout literature, there is very little written about the generational effects of management. These are important questions because non-medical business management has unprecedented influence on medical care in this country. Business managers determine how long people get to stay in the hospital, how much time physicians have to spend on documentation and record keeping, how many patients physicians need to see each day, and the entire structure of outpatient medical care. A great example is how psychiatric practice has changed from seeing patients fairly frequently and discussing many aspects of a persons care to isolated brief appointments to discuss a medication that may be only moderately effective. If you see a medical specialist - you might be limited to one appointment per year. Business managers have widely implemented team approaches and sold this idea to the public. What the public does not know is that there are management representatives on these teams who lack medical credentials and given that fact have a disproportionate amount of input into patient care. Physicians are micromanaged at every decision point. My real question boils down to what happens when that case manager on your "team" tells you that the patient needs to go and as a physician you know they are not stable and can benefit from continued care? How does a 53 - 71 year old physician react to that dilemma compared with a 22-40 year old physician? Are there intergenerational conflicts based on those reactions or the perceptions of those reactions? What are the reality factors involved? I know that there are plenty of anecdotes. It is common to hear that Boomer generation physicians are retiring as soon as possible to avoid oppression by managers. It is also common to hear that Millennial generation physicians are laboring under unprecedented levels of medical school debt. That plus a mortgage and a family gives them limited options in responding to oppressive management practices. That is especially true when short staffed hospitals offer signing bonuses to early career physicians. There is some intergenerational conflict on the maintenance of certification (MOC) issue. The Boomer generation is more likely to be incensed and point out that there is really no "evidence" that the requirements made up by the ABMS are necessary. Some of the younger generation is critical of the Boomers, especially about the fact that many are "grandfathered in" based on age. There is no more critical issue for all physician generations and the political forces that have the most to gain from MOC are just waiting for a generational split to give them the advantage they need to continue their agenda. The other movement is an exodus of physicians into private practice and in some cases cash only practices or some variation. That is a definitive way to escape oppressive management practices, but the managers and their friends in government have a long reach. The electronic health record (EHR) is one example. Even though the EHR remains not ready for prime time for a number of reasons, it is mandated for use by physicians and pharmacies. It is a relatively new cost for any physician or group who wants to try to make it outside of the systems of government payers, managed care organizations, and pharmacy benefit managers. Finding an EHR that has more value than problems is a daunting task. It is probably the most imperfect software that you can find anywhere. Those are a few thoughts on this is this Saturday morning. Make no mistake about it all physicians are targeted for oppression by managers at some level. On a daily basis it is not difficult to find some business entity that has made a bad decision about the care of one of your patients or one that is not actively trying to interfere with your care of a patient. In some cases, the physician is just an afterthought. They are swept into the battle between pharmaceutical benefit managers and pharmaceutical manufacturers over medication pricing structure and how it is reflected in the written prescription. But all of that still comes back to the physician when they are ordered to make what amount to trivial but time consuming changes. The goal of examining these issues would be to get rid of micromanagement initially. There is no reason why prescriptions for inexpensive generic medications should be micromanaged. It amounts to harassment. It seems more complicated if we are talking about teams where a manager is sitting in a team meeting and dictating care, but it is not. Most of medicine these days is still based on subjective decisions and experience. That may not seem to fit into the rhetoric of evidence based medicine, but it is the property that currently gives physician the advantage over computers. Recognizing experienced based patterns in patient diagnosis and care is the reason that medical training is necessary. Business managers don't have it. Looking at the generational effects may give physicians some ideas of how get rid of some of these practices and present a more united front to the people adversely affecting our care of patients. 1: Carol A. Bernstein. The Changing Face of Medicine: The Next Generation of Psychiatrists. Keynote address. Minnesota Psychiatric Society October 8, 2010. Carl Hart is a neuroscience professor and department head at Columbia. He wrote an opinion piece in the first edition of the new journal Nature Human Behavior about the social consequences of calling addiction a brain disease. The original article is reference 1 below with a link. I encourage anyone interested to read it several times. I say that because the concepts contained in the article are emotional, confusing, and politicized. Repeated reading allows a clearer picture of these concepts. In the introduction he discusses his early hope that by learning neuroscience and curing addiction "through neural manipulations" that he could help rid resource poor communities of crime and poverty. His main arguments against the notion that addiction is a "disease" is that the majority of people who use a drug do not become addicted and the old argument that is typically used against psychiatric disorders - there is no actual lesion in the brain to differentiate the addicted from the non-addicted. He uses the example of Huntington's or Parkinson's Disease as brain diseases that nobody would argue with. The form of those initial premises should not be lost on any student of rhetoric because one does not follow the other. With any disease that occurs as a result of environmental exposure, it is likely that a large percentage of the exposed population will not develop the disease. A lot of that depends on the toxicity of the exposure and the personal biology of the exposed. One of the best examples is alcohol exposure. It takes a certain amount of exposure to cause pancreatitis and cirrhosis both of which cause observable end organ damage and yet the vast majority of people exposed to alcohol develop neither. The epidemiological estimates are also group averaged effects, so it is possible to observe outliers who ingested well beyond the suggested dose necessary to produce the disease and yet they have no evidence of damage. The results are even more variable when it comes to Wernicke-Korsakoff syndrome an alcohol related illness caused by thiamine deficiency. The vast majority of alcoholics never develop the symptoms but a significant number of people do and there are a significant number who are diagnosed at autopsy but not when they are alive (5). An autopsy diagnosis is possible because of discrete brain lesions caused by the disorder. There is no royal road to medical diagnosis. For every condition with a defined lesion there will be several with no lesion at all. My favorite is cervicalgia or neck pain. If you follow ICD 10 codes it is M54.2. It is no small problem because at least half of the population aged 65 or older had significant degenerative arthritis and much of this is in the spine. To make things even more nonspecific, practically all of these patients will have abnormal imaging studies of the spine. Unless there is a clear finding on physical exam or by electrophysiological testing the pain cannot be attributed to any specific lesion. As the pain becomes chronic there is even less connection to any underlying anatomy or physiology. Connections between "real" diseases and biological substrates are not hard and fast by any means. In addition to Syndenham's approach to disease definition, there is a common sense approach. Even when psychiatric disorders and addictions have no clear laboratory test, polls indicate that they are generally recognized as diseases by physicians and the public in general. I would argue that all physicians encounter the severest problems in both groups of people. I speculate that the public realizes that uncontrolled use of an intoxicant to the point that it disrupts your life and leads to steady psychosocial deterioration to the point that all of your significant relationships are lost and you are unable to self correct - is a form of disease very close to severe psychiatric problems. Severe life-threatening problems that are beyond a person's capacity to self correct are seen as diseases. Dr. Hart's next argument is one that has been found in the media over the past two years - more research funding should be directed at the psychosocial aspects of addiction rather than the neurobiological and basic science aspects. We have seen this line of reasoning applied to a Stanley Foundation grant to look at the genetics of psychiatric disorders and the National Institute or Health budget itself. It is generally a utilitarian argument based on the premise that basic science and brain research produces no useful solutions or that there has been a lack of focus on psychosocial determinants or consequences of drug use or addiction. If the initial argument is that most people who use drugs do not get addicted - it does not follow that there would be widespread consequences. In terms of determinants, they have been studied in many cases in detail and in the context of racial disparities in care (2-4). But studying them and even applying common sense does not produce a solution. The clearest example is 40 years of research on psychotherapies that are effective and designing a health system designed to ignore that fact. With addiction the psychosocial research has even more readily been ignored. The argument about how the diseased brain model leads to unrealistic policies is quite a stretch. Dr. Hart suggests that such a model only allows for two solutions - focus on the diseased brain or focus on removing the drug from society. He incorrectly concludes that any focus on the brain removes an interest in socioeconomic factors in "maintaining or mediating drug addiction." Practically any available treatment for addiction whether it involves residential or outpatient treatment - cognitive behavioral therapy or twelve step recovery involves a comprehensive look at the psychosocial factors that may impede recovery or keep the cycle of addiction going. Do we really need further research to know that psychosocial factors increase the exposure to addictive drugs? After all the exposure is the first part of the problem. He has already concluded that the vast number of this exposed do not end up addicted. What is it about that exposure and that particular person who does end up with the addiction? How are they different and in any group will psychosocial determinants tell us why these differences exist? He makes the statement: "The insidious assumption of the diseased brain theory is that any use of a certain drug is considered pathological, even the non-problematic, recreational use that characterizes the experience of the overwhelming majority who ingest these drugs." That statement is totally incorrect. People like me are treating people with addictions. By definition they have uncontrolled use of the drug to the point that they are no longer able to function. In many cases they have accumulated considerable medical and psychiatric comorbidity because of their inability to stop using drugs. That is what I am talking about when I consider addiction a brain based disease. It is a disease that involves the ingestion of an intoxicant with predictable long term consequences. That is not "recreational use." The issue of recreational use cannot be taken lightly. According to the CDC, a person who is addicted to prescription opioids is 40 times more likely to use heroin compared with a person who is not. Every addicted prescription opioid user who I have talked with started out as a recreational user. Since I only see people with addictions, the only recreational users of opioids who I see, could not tolerate opioids and moved on to something else. The crux of Dr. Hart's argument seems to be that focus on neuroscience has led to malignant law enforcement efforts to eliminate drug use from marginalized citizens. He cites the differences in the legal penalties for crack cocaine as opposed to powdered cocaine a frequent illustration of discrimination against blacks as opposed to suburban whites. He seems to ignore that fact that drug and alcohol use takes a heavy toll and that toll occurs independent of race. The leap from neuroscience to politics and law enforcement is quite a leap. Is it possible for example that the police, the prosecutors and the politicians involved are more likely to discriminate against the marginalized citizens that Hart refers to? I would say it is highly likely and would offer several of the posts on this blog documenting active discrimination from politicians and insurance companies against addicts and the mentally ill. None of the people making those discriminatory policies, rationing resources or denying rational treatment care one bit about neuroscience. Most of them barely know that the brain is located in the head. Let me conclude with what is know about addictions and why that knowledge is only peripherally related to politics. A significant portion of the population is at risk for addiction. Many of them know it because they notice that there are several generations of addicts and/or alcoholics in their family and in general - most people can see that trend without talking to professional. Exposure to drugs or alcohol is the other critical variable. Contrary to the suggestion of recreational use, people predisposed to addictions recognize early on that their pattern of use is distinct from that of their peers. They recognize at one point that their ability to control it is gone. They recognize it is taking a heavy toll on their physical health, mental health, finances, and relationships but they can't stop. They recognize neurobiological features like craving, tolerance, and withdrawal. More importantly for the purposes of Dr. Hart's argument - addiction is an equal opportunity disease. Racism has certainly suggested otherwise on a historical basis, but the opioid epidemic and its reach into rural America has illustrated that anyone can become a heroin addict. Exposure to the drug is the critical factor and not the few genes that determine skin color. You can call that a disease if you want and most lay people and physicians would agree with you. My only qualification is that the definition of disease is very imprecise. People arguing that addiction is not a disease seem to not know that. Are there demonstrable changes due to addiction in animal models and humans? Of course there are and most modern addiction medicine text books exhaustively list them in each chapter on a specific addictive drug. It is much more specific to call an addiction what it is, cite the actual neurobiology and study it - just like modern approaches to any number of difficult biological problems in medicine. That doesn't rule out psychosocial research on addiction. That research happens all of the time. The problem is the same problem that was previously noted in psychiatric research. We have 30 years of research proven psychosocial therapies in psychiatry. They have modest effect sizes, but the problem is that nobody will pay for them. There is a strong overlap with addiction since many of the therapies are similar. The real cause of discrimination is not at the level of the scientific community. The real cause of discrimination occurs at the levels of the bureaucrats running the healthcare system and a political system that is clearly set up to favor businesses and the wealthy. 2: Greene EL, Thomas CR. Minority Health and Disparities-Related Issues: Part I. Med Clin North Am. 2005 Jul;89(4):721-919, PubMed PMID: 16129107. 3: Greene EL, Thomas CR. Minority Health and Disparities-Related Issues: Part II. Med Clin North Am. 2005 Sep;89(5):921-1066, PubMed PMID: 16129107. 4: Ruiz P, Primm A (eds). Disparities in Psychiatric Care. Philadelphia, PA: Lippincott Williams & Wilkins, 2010. 5: Sechi G, Serra A. Wernicke's encephalopathy: new clinical settings and recent advances in diagnosis and management. Lancet Neurol. 2007 May;6(5):442-55. Review. PubMed PMID: 17434099.